Boynton Beach Florida has a slogan: "We Make Life Fun". So, if you need some fun, as well as some good Sun Therapy, come on down! 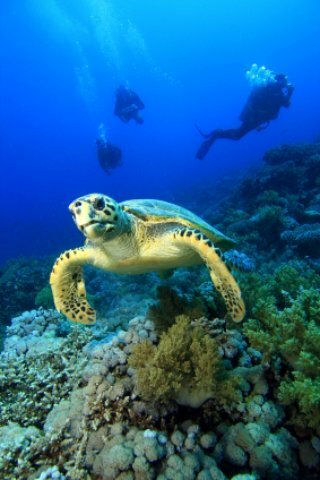 To start the fun and sun stuff, how about getting to know our underwater residents? Diving is the water sport of choice at Boynton Beach. Tour boats will take you to places where you can spot beautiful sea creatures like this hawksbill turtle, ready to pose for your underwater camera. If you don't dive, at least don some snorkeling gear and investigate the underwater landscape and meet the creatures below. This beach is a popular fishing spot and offers easy beach life for all of its residents. So grab a fishing pole and come teach the kiddies how to catch a fish. Boynton Beach is an upscale residential place to live especially if you can afford to live on the Intercoastal Waterway. Note that Boynton is often misspelled and mispronounced as Boyton. For the well-heeled, an expensive home on the Intercoastal Waterway practically requires a big yacht in back. Boynton Beach Florida is deliciously sandwiched between Palm Beach Florida (to the north) and Delray Beach Florida (to the south. So if you have time to explore, visit both these nearby beaches. While Florida beaches may be similar in water and sand quality, the amenities, attractions and available water sports may vary greatly from beach to beach so you never know what you are missing if you don't get out and investigate. Many folks come to vacation on Boynton Beach with swimsuit in suitcase and cash in wallet because ... Boynton is a great shopping mecca. Boynton Beach Mall has something for everyone with over 130 retail and specialty stores, a kiddie play area and many restaurants to keep that shopping energy up. Ready for the bonus? There is a movie theater in the mall so send the men-folk and kids to the movies and you can hit the stores without bother. There is a daily fee for beach access but you can get a pass for longer stays. It’s well worth a little fee to enjoy a beach barbecue while the kids run along the shore or play on the playground. The older kids can shoot hoops on the basketball court. For a day of easy nature hikes where you’ll be surrounded by coastal beauty, visit Arthur R. Marshall Loxahatchee National Wildlife Refuge. Enjoy a dive off of a tour boat from Underwater Explorers to get a full appreciation of why this peaceful beach is so popular with locals and those who are just passing through. Get some of the freshest catch while the rest of the family swims, snorkels and plays in the water at Boynton Inlet. Kids of most ages: Kids will enjoy playing volleyball or even basketball right on the beach, or fishing with dad since a good catch is almost a sure thing here. It’s a great place to learn how to fish. Eating: Enjoy a little bit of Chicago dining… in Florida? At Chicago Joe’s you can do just that. For a taste of the local cuisine in a fun and friendly atmosphere check out Hurricane Alley. Sleeping: Hampton Inn Boynton Beach is a nice choice, or relax at Courtyard by Marriott Boynton Beach.